From June 2 through August 2 we’ve been asking food and tech innovators: “How might we use technology and design to hack a better future for dining?” We’ve posted 50+ contributions from Mario Batali, Joanne Wilson, Mitchell Davis and many more. 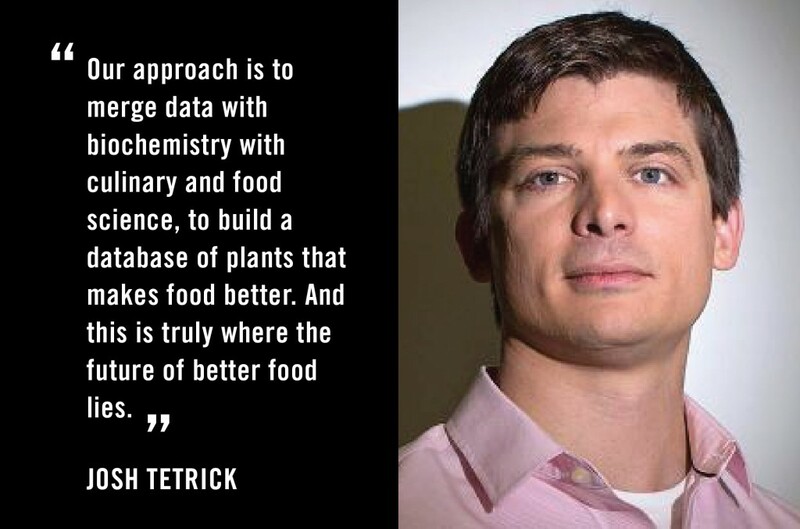 Today, we are thrilled to share our interview with Josh Tetrick, founder of Hampton Creek. Backed by Bill Gates and Khosla Ventures, Hampton Creek is on a mission to make better food available to anyone, anywhere. It’s using data and technology to find more efficient, affordable and sustainable plant-based alternatives to common foods. Josh and his team started by turning the $7 billion US egg industry on its head by creating egg-free alternatives for products like mayonnaise and cookie dough. Josh dives into Hampton Creek’s new initiative to build the world’s largest database of plants, the social and environmental mission behind its products and his advice for burgeoning food entrepreneurs. Check out our interview below to learn about his critical ideas for the future of food production. Food+Tech Connect: What does a better future of dining look like to you? Josh Tetrick: To us, it’s truly about making better food choices easier for regular people. That’s it. What we’re doing at Hampton Creek is completely unique from any other food company out there – it’s a wholesale reinvention of how we do things in food in general – not just animal agriculture. Our approach is to merge data with biochemistry with culinary and food science, to build a database of plants that makes food better (i.e., healthier, affordable, convenient, easier, sustainable). And this is truly where the future of better food lies. FTC: Hampton Creek just announced its plans to build the world’s largest plant database. Can you tell us more about the database and how it will allow you to create this better future? JT: Sure. We’re scanning hundreds of varietals of plants every week…and we need to have this data completely and thoroughly organized/categorized so that as we grow and expand, we can go back and utilize what we’re discovering daily. It’s a vast amount of precious information that we will be able to expand and capitalize on down the road. And we’re using very smart data scientists (led by the former head of Google Maps) to make this plant library happen. FTC: What are some of the other ways technology is making this future possible? JT: Technology is improving the future in many ways, from food, to healthcare, to travel – it is really the future of everything. FTC: Hampton Creek set out to turn the $7 billion US egg industry on its head. But egg production is only piece of the industrial agriculture industry pie. What animal products might Hampton Creek tackle next? JT: For us, it’s more about capitalizing on plants than it is about going after eggs or dairy etc. We’re just finding more efficient, cheaper, and more sustainable ways to create products that more people can enjoy. There is a whole world of plants out there we can use to make food better, tastier, healthier, and more sustainable – we do that. And we think we can make cookies and mayo better. We think we can one day take out sugar, and trans fats even. It’s really not about intensive animal agriculture; it’s about finding plants that work better. One day we’ll find plants that will 10x sugar, dairy, and who knows what else. FTC: What are the greatest lessons you’ve learned building and growing Hampton Creek? JT: Not to do things a certain way just because that’s “how they’re done.” We’re using a biochemistry team which lets us move WAY faster than a typical food company and is completely and utterly unique. None of the people on that team even have a background in food. When you start a company you’ll have to make some tough choices along the way. And people may tell you you’re crazy, especially when you go against industry standards, but that’s part of what being an entrepreneur is.